I love to travel, and Morocco is definitely on my bucket list. So while I might not be able to get to Northern Africa any time soon, I can certainly trigger my imagination through a hearty bowl of soup inspired and flavored by warm Moroccan spices. It was after a stop in one of my favorite spots in town, Savory Spice Shop, that I developed this recipe. I go there often, but typically try to limit myself to necessities or basics. This time I had a gift card and let myself just shop and get inspired, eventually grabbing a few new spice blends, one of which was the Marrakech Moroccan Spice. The curry-style blend includes cinnamon, turmeric, nutmeg, and even rose petals. If you can’t find a similar Moroccan spice blend I would look for Ras el Hanout, a fairly common Moroccan blend of spices. This vegetable soup is really easy, allowing for Moroccan flavors to be accessible, even if they’re new to you. I love making a big pot of soup because not only does it make for an easy meal but also for great leftovers, a win-win with busy schedules. You can throw this soup together in a matter of minutes and let it simmer away until it’s ready to go. I topped mine with almonds, golden raisins, and chopped fresh parsley to add some extra texture and flavor. Make some Moroccan-spiced vegetable soup and let your tastebuds take you away. 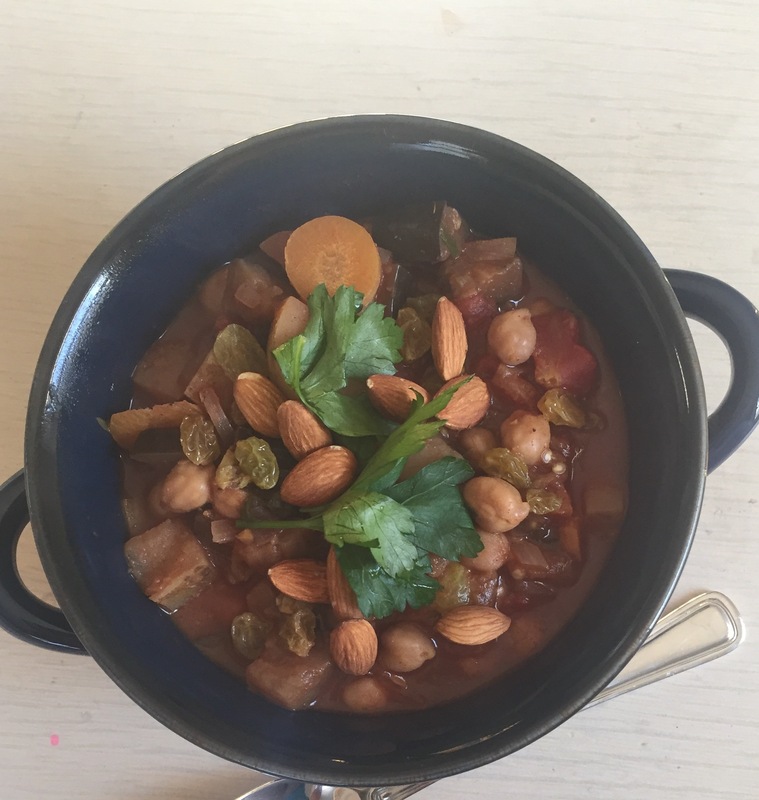 An easy vegetable soup with chickpeas and a Moroccan spice blend to create a unique and flavorful soup, ready in under and hour. Almonds, golden raisins, and parsley make for great toppings. In a large pot heat the olive oil. Add the onion and cook until soft, about 5 minutes. Add the garlic and cook until fragrant, about 1 minute. Add the Moroccan spice and stir to allow the spices to toast, about 30 seconds. 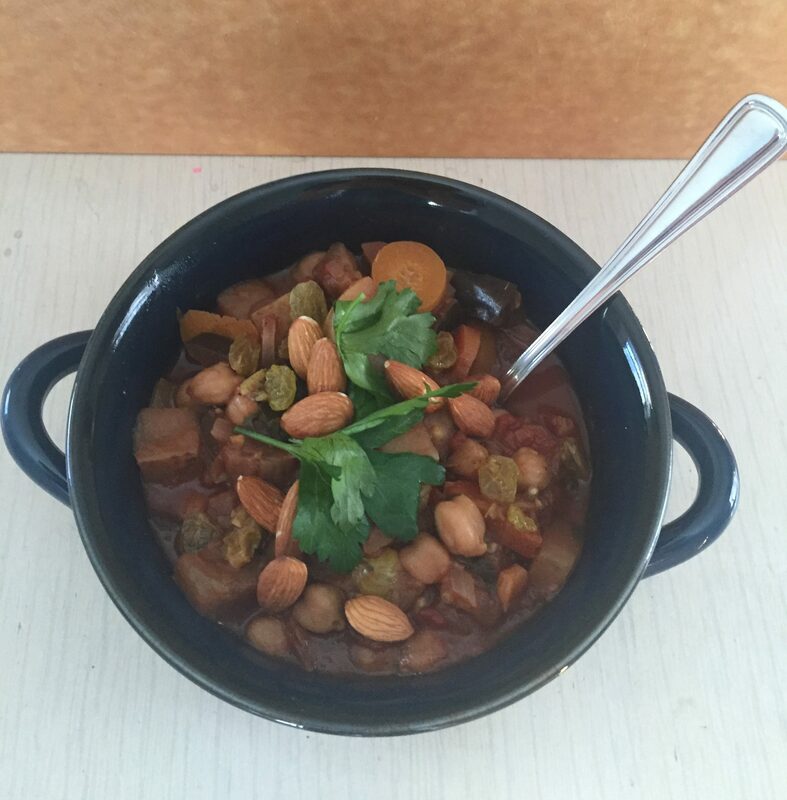 Stir in the potatoes, eggplant, garbanzo beans, and carrots. Add the the diced tomatoes, water, and salt. Bring the soup to a boil then reduce to simmer until the potatoes and carrots are tender, about 35-40 minutes. Serve the soup with extra golden raisins, parsley, and chopped or slivered almonds as a garnish. *Note this soup is quite chunky and doesn't have a ton of broth, which is intended.